Before you get a Mandala shoulder tattoo female, you should know the meaning of this symbol. Mandala is derived from the Sanskrit which means circle. So in order to actualize this concept, you have to make sure that the tattoo looks like a whole big circle. No matter if you want to build it using geometric shapes or another, in the end the pattern should look like a circle. The Mandala style has been gaining in popularity in recent years. Many have cited it as an inspiration because it carries good meanings. The Mandala style represents eternity and balance. Interestingly, this pattern seems ubiquitous because it’s used by different religious beliefs and cultures. You’re likely to find it in Buddhist, Hindu, and Christian. Although it’s characterized by a circle, a Mandala tattoo can also look intricate depending on your approach towards the design. You’re free to combine it with another style and make it more interesting. The style may also represent feminism. As we all know, a flower typically has a round part surrounded by petals. In other words, this would be perfect if you’re a girl given the tattoo could depict the blossoming of your life. The design is slightly reminiscent of the geometric style. It comes as no surprise since both share similarities. They are built on symmetry, but the geometric style has a broader scope because it’s more than just a circle. In terms of complexity, you can guide your tattoo parlor what design he should work on. During the process, he’d probably draw an outline and add layers one step at a time. Everyone has their own goal, so we can’t use other people’s standards for our own design. 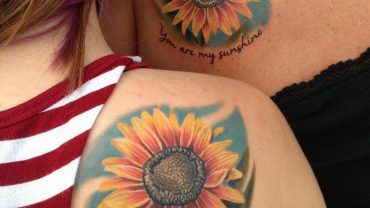 Creativity knows no bounds, while taking inspiration from established tattoos isn’t wrong in any way, it’s important to put your own spin on it. There are many ways to boost its appearance. For example, you can add 3D effect to the tattoo. It works perfectly well for this particular style. Your tattoo artist could make it work, we believe. Secondly, add more colors. Black is a staple, but it shouldn’t be the end of it. People like black due to its versatility. It seems we can do no wrong with this shade, but other colors will make the tattoo more alive. That would be mandatory if you’ve always preferred vivid colors to black / white or grayscale. However, this has to be done correctly to avoid oversaturation. Too many colors also don’t look good especially on a very small tattoo. The shoulders are quite broad, so there’s much space to experiment. You can pick either side or draw a full back Mandala shoulder tattoo female.